Chicago is a great city for museums, and I have been able to see a lot of outstanding exhibitions growing up so close to this city. One museum that I usually go to multiple times a year is the Museum of Contemporary Art in Chicago. From Kerry James Marshall, to David Bowie to Alexander Calder, the museum hosts a number of notable contemporary artists, and you can see most of the museum in under three or four hours. I am spending my fall break in Chicago and was very excited to get to visit the Museum of Contemporary Art. One exhibition that really stood out to me was titled “The Making of a Fugitive.” The exhibition looks at the how “fugitive” is defined and how the media has shaped the story of a fugitive. The exhibition combined painting, photos and sculpture to create a compelling presentation that forced viewers to think of someone who is more complicated, a fugitive who is more than just someone escaping somewhere. The piece in the featured image really caught my eye. 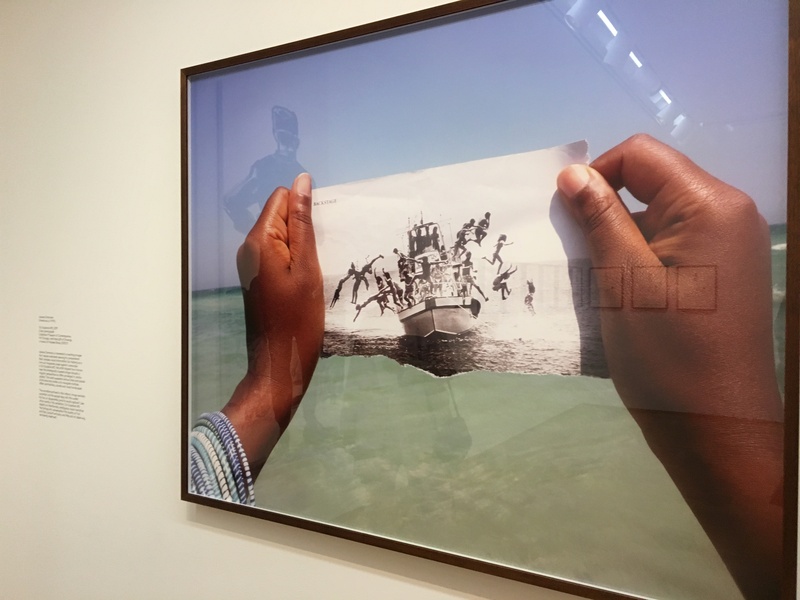 The photo is by Xaviera Simmons and the exhibition explained how the image is meant to show two horizon lines. It seemed to be hinting at there being multiple perspectives in this piece, kind of like there are multiple perspectives of what a fugitive is being shown in the exhibition. The label read, “The work suspends various times and places all at once and invites us to navigate multiple, often contradictory, stories and visual landscapes.” There seem to be multiple layers to the image, each allowing the viewer to ask a new question. Another piece that stood out to me was “Escape Survival Manual,” which was a tiny book that was described as something that could be “used in order to survive.”The variety in size of items really made the exhibition that much more interesting, and the way this tiny item was displayed with a magnifying glass was really great. The idea of a manual for survival adds another interesting component to this story of a fugitive. Another reason I like going to the Museum of Contemporary Art is its somewhat central location in the Gold Coast neighborhood. Here is a bit more information on the museum’s building and neighborhood.